Daniel and Mary Beth are such a sweet and classy couple and are so head over heals for each other! 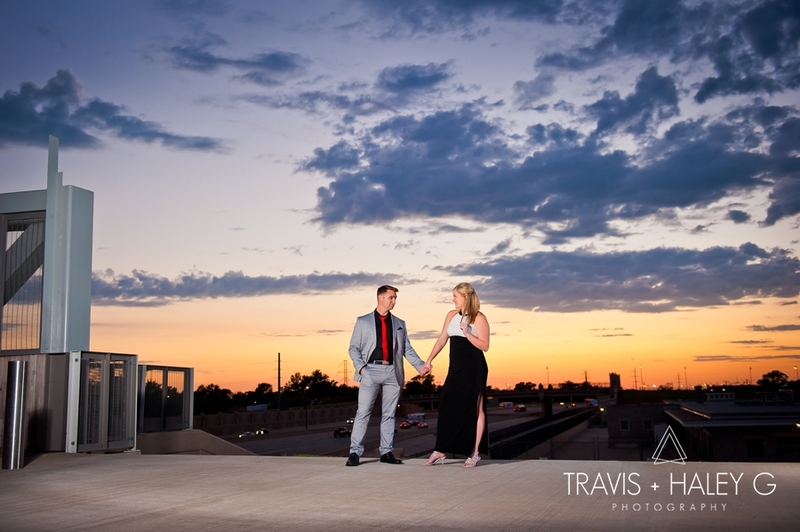 When we asked them what they had in mind for locations for their engagement session, without hesitation they enthusiastically said, "Something cool and modern in Bricktown OKC, and we would love some night photos with the sunset too!" We said of course that's our specialty, we always love it when our couples request night photos! 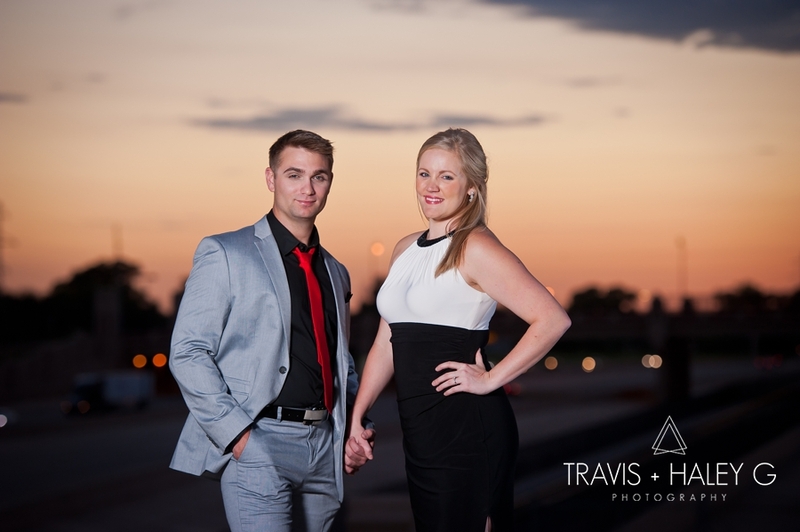 We started D+MB’s engagement session at the Devon Tower area in Bricktown, Oklahoma City. This place is one of our favorite spots to photograph in downtown OKC. It has modern clean lines with just the perfect amount of trees and an amazing view of the Devon Tower! 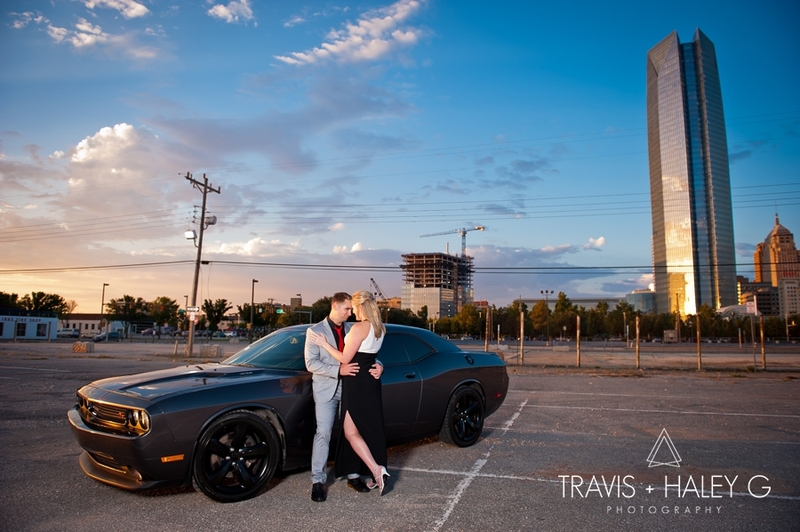 On our way to the Skydance Bridge, Daniel asked if we could take some quick shots with his Dodge Challenger. We said of course, Travis never turns down photographing cars! As D+MB pulled the car around to position it just right, they stepped out with Daniel in his gray modern suit and Mary Beth in her gorgeous black and white dress looking like a couple of movie stars. 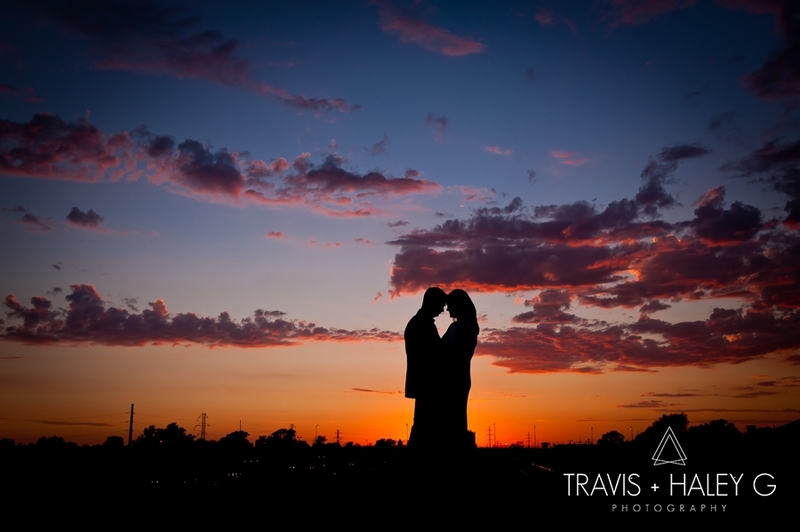 Since D+MB looked like a million bucks, we timed it perfectly to get that breathtaking Oklahoma sunset! We then concluded the night with D+MB and a romantic embrace under the glow of the Skydance Bridge in OKC! We first knew of each other when we both attended high school in our hometown Ocala, FL. Our romance didn’t spark until 6 years later. Mary Beth became very good friends with Daniel’s sisters and was invited to a family vacation in Las Vegas. We were the only single ones on the trip and on the second night we first kissed on New Years Eve at the stroke of midnight while over looking the fireworks on the Vegas strip from the Mandalay Bay Hotel. From that moment on we were inseparable and ran around the casino hand in hand like little kids. When it came time for Daniel to leave to go back to Oklahoma we shared a tearful kiss goodbye and Daniel, ever so smoothly, said “call me if you want a boyfriend”. From then on we were stuck on each other. We dated long distance for a year and then Mary Beth packed up her car and drove out to Oklahoma City on Valentine’s Day in 2015. After being apart for a whole year we made up for lost time by moving in together. 15 months later Daniel proposed. Daniel had secretly been planning a Bahamas proposal for 6 months. We went on a family vacation to the Florida Keys and part of the vacation plan was to boat over to the Port Lucaya in the Bahamas for fishing. Little did Mary Beth know the whole family was in on the plan. We had an amazing dinner at a local restaurant and went to the beach for “sunset pictures”. Daniel then pulled Mary Beth aside and said “You’re my best friend, do you have any plans for the next 80 years?” and pulled out a beautiful, shining ring. Mary Beth’s response was “no” (referring to the fact that she was free for the next 80 years) and the family in the distance screamed “DID SHE SAY NO?”-we had a good laugh and quickly clarified that the answer was yes. Daniel and the family surprised Mary Beth with a bottle of champagne and a beautiful beachfront villa decorated with rose petals.